The intergenerational project, “From one generation to the next” began its journey on the island of Skopelos, Greece in May 2017. The aim of the project was to bring together two generations and to introduce kindergarten aged children (5-6 years old) to the amazing world of oral history. The project was supported by the TIMA Charitable Foundation. What was the starting point? We discussed with the group of 20 children the kinds of questions they could ask older people to find out more about the past. We tried to motivate them by choosing three topics, everyday life, games and folk tales, which we thought would be interesting for them and might stimulate their curiosity about the past. The idea was that they would find out from the older people the way they had lived and played as children, and what were the differences and similarities between then and now. 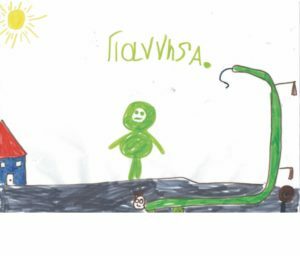 ‘The dragon in the water’ based on the story of how St. Riginos saved the people of the Island of Skopelos from a wild dragon, which was one of the stories the children heard in the project. The preparation in class was followed by the intergenerational meeting between the 20 kindergarteners and the 8 elderly who were the narrators. During the meeting, we helped the children to record the voices and the stories the older adults told. Back in their classroom, the children re-listened to the stories. Then each child chose the story that fascinated him or her the most and made a painting to capture it. We realised from the beginning that, due to their age, the children wouldn’t be able to carry out a complete “grown-up” oral history project. However, we believed that they would be able to respond in a way that made sense to them and they would benefit from this first acquaintance with oral history. The results were a pleasant surprise for us. Our little oral historians, or as we call them. “little detectives of history”, listened very carefully without interrupting, and asked questions based on prepared material. They also didn’t hesitate to ask their own questions during the audio recording. In the end, the children came to understand that the old people were once children themselves. Although we expected that children would focus mainly on games and folk tales, they showed special interest in finding out more about the everyday life in the past, in asking what it was like for these grandpas and grandmas to be a child and in comparing it to their own lives. Another goal of this first pilot project was to stimulate communication, one of the pillars of oral history. We tried not simply to bring the two generations “closer”, but also to encourage the development of real communication between them. In this way children understand that on the one hand old people have a “story” to tell and knowledge to convey, and on the other hand, children can learn something about the past from the memories of people who have experienced the past. ‘Pulling the island’, capturing the tricks and teasing that traditionally happened between the islanders living on Skopelos and Skiathos. 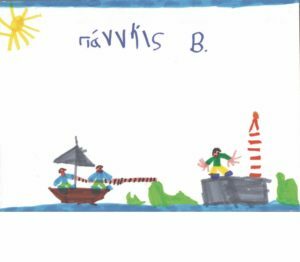 The response of the kindergarteners but also of the older adults to this pilot encouraged the team of the project to continue its journey to more islands. We sincerely want to improve and develop the project. But mostly we want to continue our efforts to stimulate children to learn about the past and to bring these two generations together in a creative and purposeful way. Plegma, www.plegma.org, a civil non-profit organization based on the island of Skopelos, Greece. Our mission is to implement cultural actions, accessible to all members of the population, with no age, educational, geographical, racial or religious restrictions, thus supporting and reinforcing cultural policy at a local and country-wide level. If you are interested in discovering more about intergenerational oral history projects, you might like to read this earlier TOY Blog.